Covers greys roots and any lighter regrowth instantly in one push. 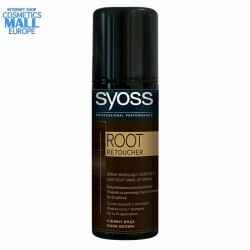 Root Retoucher Dark Brown is a temporary, easy-to-use, spray that offers an instant color touch-up for your roots. It dries immediately leaving an even color result harmoniously blending into the hair lengths. Thus, one shade can be used for many hair colors and different shade directions. It washes out after 1 shampoo and is reusable for up to 25 applications. The precise spray applicator applies product only where needed. As easy to use as a daily make-up. Always look like freshly colored - in just one push!